The underlined headings below are links that take you to that section in the YouTube video for this tutorial. In this video I will show you how to cast off using the basic stranded cast-off. Although this cast-off creates a very stretchy edge, it is unattractive. It is often used in hats for gathering up the stitches around the crown. It is also great for a gauge swatch. You will need an embroidery needle to make this cast-off. Break off the working yarn at the length of the fully-stretched fabric, with extra for sewing in the end. Now thread this onto the needle. I am using a darker yarn as well as the working yarn so that you can see more clearly. 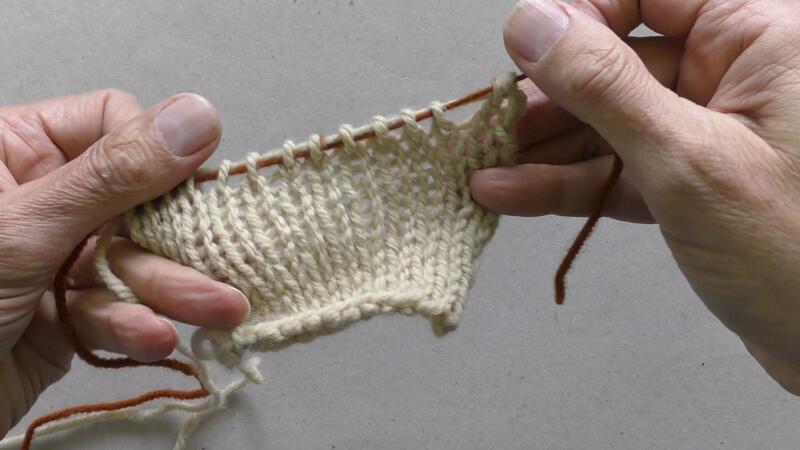 Pick up the stitches purl-wise one or two at a time from the left hand needle. Then pass them along the embroidery needle to the working yarn. Work your way across the stitches until the knitting needle is empty. You can now pull the working yarn through the loops – if you pull too tight, you can pull it loose again. You can see the working yarn passing through the loops in a straight line (the dark yarn makes this easier to see). You may be able to see the yarn moving through the loops as I pull it from either end. If I pull out the dark yarn, leaving the working yarn behind, you can see how the cast-off normally looks. This cast-off is very stretchy. I have shown you the basic stranded cast-off. It is great for gathering stitches and for gauge swatches. Thank you for watching. Happy knitting! In this video I will show you how to cast on using the basic stranded cast-on. It is unattractive and is seldom used for anything other than gauge swatches. 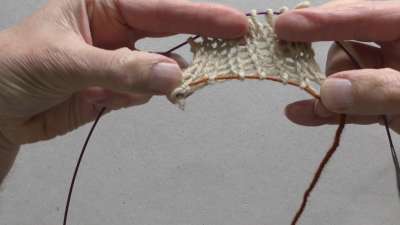 The basic stranded cast-on uses two strands of yarn – the tail end and the working yarn. Usually these are the two legs of a loop. I have tied a dark coloured yarn for the tail end to a light coloured yarn for the working yarn. This should make it easier to see what is happening. Hold the yarn in your left hand. The tail end should be over your thumb, and the working yarn over your forefinger. Run both yarns across your palm and hold them in place with your other fingers. Now you need to make the first loop on the needle. Hold the needle in your right hand pointing to your right. Place it under the yarn between your left thumb and forefinger. Lift and turn the point over the working yarn. Now you have a loop with the working yarn closest to the tip and holding the tail end in place. Keep the yarn between your forefinger and thumb tight. then move it forward and under the tail end before bringing it up and back between your thumb and forefinger. You now have a second loop of the working yarn over the needle that is held in place by the tail end. Move the needle under the working yarn on your forefinger, lift it and move it back to the centre. You make extra stitches by repeating these two movements. move the needle towards you, over then under the tail end, behind the working yarn, under the tail end. under the working yarn and back to the centre. Each of these pairs of movements makes two stitches. You will have an odd number of stitches on your needle – the original loop plus pairs of cast-on stitches. Stop when you have enough stitches – with one extra if you need an even number. Turn the needle round and hold it in your left hand. You are now ready to start the first row. If you need an odd number of stitches you need to trap the working yarn on the needle with the tail end. and in front of the working yarn. Hold it in place against the needle with the fingers of your left hand. This will give you a firm loop to knit. If you need an even number of stitches, you have an extra stitch on your needle. Carefully take the last yarn-over off the needle. The tail end is lying loosely around the working yarn. Hold it against the needle with the fingers of your left hand. Now you can start to knit. so that the stitches can move freely along it. 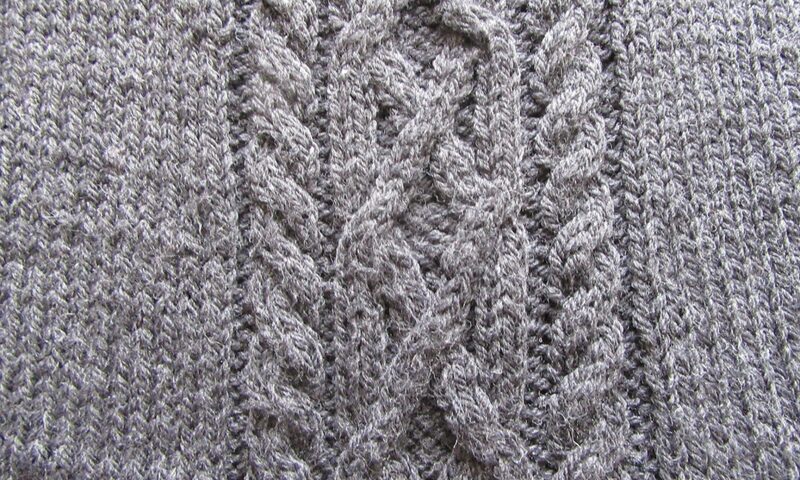 This means that the cast-on edge does not pull on the body of the knitting. In this video I have shown you the basic stranded cast-on. I hope you have found this video useful, and that you will be able to use this cast-on for your gauge swatches. You can see a pictorial tutorial for the basic stranded cast-on in the T-Reference section of this website. 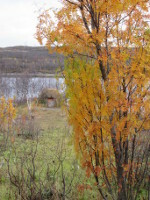 This example of a traditional Sami turf hut is opposite the Borderlands Museum in Kirkenes, Norway. Røros in Norway was founded in 1664 as the hub of a copper mining area. No longer active as a mining centre, Røros is designated as a UNESCO World Heritage Site. Sami turf hut outside the Borderland Museum in Kirkenes, Norway. Wooden wall in Røros, Norway. Le Puy in France is perched on the top of volcanic outcrops, and Saint Michel d’Aiguilhe appears to be the most delicately balanced building in the town. Is anything as relaxing as a beautiful sunset? The spectacular Iguazu Falls lie on the border between Argentina and Brazil.